The area received its name when, in 1836, Thomas Sugden, John Coats and Mr. Garton came to a beautiful prairie and saw a “huge” bald headed eagle soaring overhead. The first claim was made by A.R. Hinkley but the first permanent settlers were E. Thomas and wife, who erected a house in 1836. Before the end of that year, the first mill in the town of Eagle was built in Eagleville. When the southern branch of the Milwaukee & St. Paul Railroad came through the town in 1851, the village of Eagle Center was created, leading to the eventual decline of other villages in the township. With the passing of time, the village name evolved to Eagle. 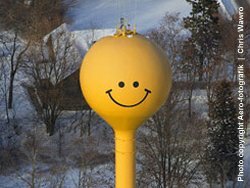 Home of Old World Wisconsin, which is a living, turn-of-the-century museum, and the Smiley Face Water Tower.